In 1887, Tesla began experimenting with very high frequency alternating current, and eventually developed the so-called Tesla Coil. This was a radio-frequency transformer consisting of a spark discharge oscillator and a tuned secondary coil. In 1899, Tesla built a 200,000 watt coil in Colorado Springs. Capable of generating arcs of up to 135 feet, he claimed it was tuned to a harmonic of the earth’s resonant frequency and had established electrical standing waves on the globe. In 1900, Tesla began the construction of an incredible 200 foot coil with a dedicated powerplant. Tesla’s vision was far ahead of its time, including the concept of one-to-many broadcasting, radio navigation signals, encrypted communication, a broadcast time standard, and wireless image transmission. Nikola Tesla was born on July 10, 1856 and died on January 7, 1943 . During his lifetime, the technology of modern radio and electric power was born. Tesla made many important contributions in these fields. The most important and the most famous of these was the invention of polyphase current. This allowed practical distribution of electricity for long distances and enabled efficient electric motors. He developed generators, transformers, and motors both of polyphase and split phase. 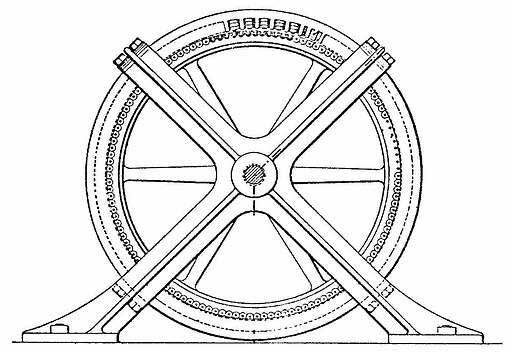 Today theseinventions literally turn the wheels of industry. Tesla knew that the world would need more and more power if it was to advance, and he devoted his life to developing new means of producing and distributing power. The most fascinating project that Tesla conceived was a plan for transmitting electricity without wires. This project took up more than twenty years of his life and was never completed successfully. However, the discoveries that Tesla made during this time almost led to the creation of a global radio network decades before the present one was first established. Tesla’s first work with high frequency electricity began in 1889 . A year earlier, he had received $1,000,000 from George Westinghouse for his polyphase patents, and with this, he planned to begin researching new ideas. Tesla occupied the entire fourth floor of a six-story building at 33 and 35 South Fifth Avenue in New York City . Ever since 1887, when Heinrich Hertz had discovered radio waves, Tesla had been fired with the ambition to explore the range of frequency between his alternating current and the extremely high frequency vibrations of light . By 1890, he had made a great deal of progress. His first experiments were with a unique new high frequency alternator . This was made up of a steel disk 30 inches in diameter with 384 poles like the teeth of a cog that had zigzag windings on them. This disk revolved within a fixed ring that had 384 inductor poles. When this machine was turned at 3000 rpm, it produced about 200 volts at 9600 to 10,000 Hz. Tesla was the first man to work with such a device . Later machines of somewhat different design produced up to 30,000 Hz. With these alternators, Tesla discovered the basic principles of tuning. Although electrical resonance was known at that time, it was primarily a theory that rarely manifested itself. However, at the high frequencies that Tesla was using, the devices would not function unless tuned to resonance. In experiments with the alternators, he made use of induction coils to step up the voltage. At first, ordinary coils were used, but Tesla soon found that by removing the iron core, he could improve the output of the coils. In some instances, the coils were immersed in boiled linseed oil for insulation. Tesla may have been the first electrical engineer to use this now common technique for insulating high voltage. Using partially evacuated glass tubes, Tesla began extensive investigation of lighting systems using fluorescent tubes much like modern neon lights. This was not original work at that time, but several discoveries were made during these investigations. Tesla was well aware of the heating effects of high frequency currents and fields, and in 1891, he became the first man to suggest the use of radio frequency warming for therapeutic purposes . For a more reliable power source, Tesla took advantage of the fact that when a capacitordischarges through a coil, the energy oscillates rapidly back and forth between them. This formed the basis of the Disruptive Discharge Coil, or as it is known today, the Tesla Coil. In this device, a high voltage induction coil or transformer charges a bank of leyden jars or other high voltage condenser. When the voltage on the condenser builds up to a high enough level, it discharges through a spark gap and a primary coil. The current oscillates at a frequency that may be several million Hertz. A large secondary coil is energized by the primary coil and reaches very high voltages. These first coils were of the same type used with the alternators. They produced arcs about five inches long, indicating a voltage of about 100,000 V was being produced . Tesla, having invented the method of transmitting power long distances on wires, seemed to want to outdo himself when he became fascinated by wireless power. In 1892, just after returning from a European lecture tour, he decided to experiment with long-range power transmission . Actually he had done some very interesting experiments long before then that probably led up to this. One of the earliest experiments that he performed at his lectures with wireless power was to set up two large metal plates about 18 feet apart. On a table between these plates were some of his glass tube lamps. When the plates were connected to a powerful oscillator, the tubes lit up. Tesla first demonstrated this in November of 1890 . Although these experiments were amazing for that time, they did not offer a means of transmitting power, and Tesla knew it. They were simply induction effects on a very large scale. Tesla’s first announcement of a possible plan for wireless broadcasting was made in a lecture delivered before the Franklin Institute in Philadelphia on February of 1893 and before the National Electric Light Association in St. Louis on March of the same year . The lecture was entitled “Light and other High-Frequency Phenomena.”In this lecture, a part was included on resonance. Tesla showed that by using a circuit tuned to resonance, and using very high frequency, only a single wire was necessary for carrying power, with no need for a return conductor. In doing this, a light or special radio frequency motor would be connected with one terminal to the oscillator and the other to a large metal plate. After demonstrating this, Tesla suggested that since only one conductor was needed for high frequency, then possibly the earth could be used as that conductor. By learning the resonant frequency of the earth, the transmission of intelligence or even power could be possible. In the above diagram used in the lecture, an oscillator S is connected to an elevated plate P, which acts as a reservoir of electricity (condenser), and the ground, which would also act as a reservoir. Any electrical disturbance would create an effect or change in potential in the earth, which could be detected within a certain radius. However, what this radius would be is very hard to tell. Tesla had no idea of what the electrical properties of a huge sphere like the earth would be. Tesla suggested the use of a trial and error method of finding the earth’s natural period of vibration (if it had one at all). This could be done by using an oscillator of very great power and trying different frequencies to see which one would cause the greatest effect on the surrounding ground. Tesla later explained the problem of finding the resonant frequency of the earth.What he had to know was whether the earth behaved like a conductor of finite dimension or as an infinite conductor. He believed that the earth would act much like a wire would in carrying radio frequency electric waves. If the earth acted like an infinite conductor, no resonance effects would exist. As in a wire of infinite length, the waves would travel along the wire with no reflection and no build-up of power. If this were the case with the earth, Tesla’s transmitter would create local vibrations that would vanish and fade into the distance. However, if the earth acted like a finite conductor, it would have a resonant frequency. The current would travel along the earth until it reached the opposite side and was reflected back. On its way back, the waves would interfere with the oncoming waves and produce interference. If the distance from the transmitter to the opposite side of the earth were equal to one half of the wavelength of the disturbance or any multiple of that, the waves would completely cancel out. If though, the distance is equal to one-quarter wave length or any odd multiple of it, the waves would add together, and a state of resonance would exist. Naturally, Tesla knew that the earth was finite, but it could have acted as an infinite body due to resistance and its curvature, which might have absorbed the waves before they could be reflected. The first step toward discovering these facts was to build an oscillator of sufficient strength to disturb the earth’s electrostatic equilibrium. Since Tesla did not keep many notes on his experiments, very little is known about the details of his research. It is known, though, that in the latter part of 1892, he made an important discovery. Up to that time, the disruptive discharge coils bore little resemblance to the well-known Tesla Coils of today. This was because they were built much like regular induction coils, with a multilayered spool for the secondary and the primary wrapped around it. The power and voltage of these devices was limited to the insulation possible with such a configuration. Tesla found that by making a large coil with a single layer of wire on the secondary, extremely high tension could be produced with ease. Tesla called this the Quarter Wave Coil because the length of wire in the secondary coil was about equal to a fourth of the wavelength of the oscillation it produced . The primary coil, which is only a few turns of heavy cable, is at the base of the secondary and very loosely coupled to it. The base of the secondary is grounded and voltage develops at the upper terminal instead of both ends as in earlier coils. Using a conical coil, Tesla developed 1,000,000 volts in the spring of 1893 . This coil can be seen in the first photograph (above). A transformer of very high voltage powered it. The condenser is a bank of 32 leyden jars, which can be seen to the left and right of the coil in two banks of 16 each . The spark gap can be seen to the left of the coil. This was a “quenched gap” made up of a long row of thick copper disks stacked together with small spaces between for the spark. [DPM - a series gap] Behind the coil is an oscillator of the older type, immersed in a wooden oil tank. An ebonite sheet between the two high-tension terminals prevented corona lose. In 1893, Tesla was involved with Mr. Westinghouse in the design and installation of generators of the polyphase type in a amazing new power plant at Niagara falls . Later in 1894, the Worlds Fair was to be illuminated by alternating current, and both Tesla and Westinghouse were very busy with this . Tesla was given a personal exhibit there, where he demonstrated his AC motors and some of his high frequency discoveries. In 1895, on March 13, Tesla was felled by a great tragedy . The six story building in which his laboratory was located burned down. The fourth floor, where his equipment was, collapsed down to the second floor and all his machinery was destroyed. None of it was insured. His lecture equipment, notes, photographs, and his famous Worlds Fair exhibit were all lost. This, however, was not the greatest loss. Tesla possessed a phenomenal memory and could easily rebuild, and many of his photos were copied. At the time that Tesla’s lab burned down, he was developing a wireless transmitter for communications. By 1895, Tesla claimed to have completed this system and was prepared to test the prototype . There is little doubt that Tesla’s powerful oscillators could be used for this purpose with success. In that same year, Marconi officially became the first man to send signals without wires . The apparatus that he used was of the most primitive order (above). 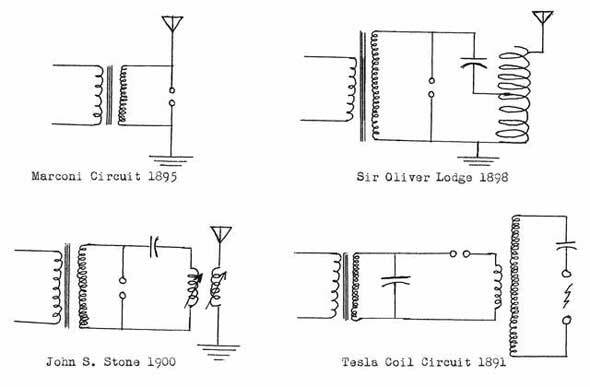 The highly advanced four circuit tuned system used by Tesla was not patented for radio used until 1900 . At the time of the fire, Tesla was at the height of his scientific fame. A number of people contributed money to him, and he himself was by no means poor. Four months after the fire, in July of 1895, he took up residence at 46 E. Houston Street on the top floor, and began to reconstruct his laboratory . He Spent the next year or so rebuilding the equipment he was using in his first lab. The second lab was illuminated entirely by fluorescent lighting, some of which was wirelessly powered. Tesla, who had a flair for the dramatic, would often close the heavy shutters during the day and show visitors the eerie moonlike glow produced by these lamps. From 1896 though 1897, Tesla carried on work in several lines of research, includingmechanical oscillators and solar power engines . However, his primary fascination was still with high frequency current. 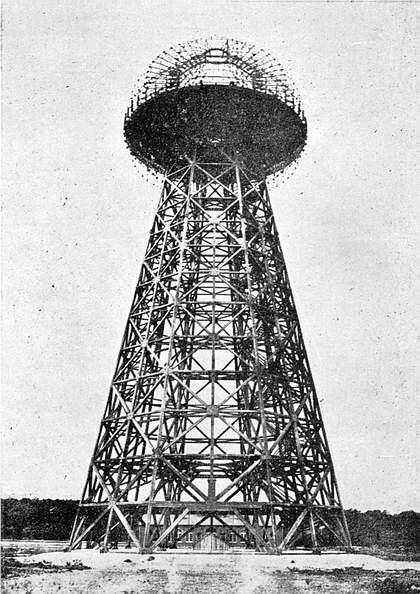 To investigate wireless power further, Tesla wanted to study the effects of voltages beyond the one million volts produced by his conical coil. He had not yet detected any earth resonance effects. By building bigger and bigger coils, Tesla knew that he could reach any desired potentials, but he felt that there should be a better way that would not require bulky coils or cumbersome insulation. In other words, he wanted to make a relatively small transformer that would be able to deliver almost any voltage. Tesla found the solution while experimenting with variously shaped quarter wave coils. He found that when a flat spiral shaped secondary is used, there is an absence of corona loss and shorting between turns . Even when bare wire was used, there was no difficulty in producing many millions of volts. 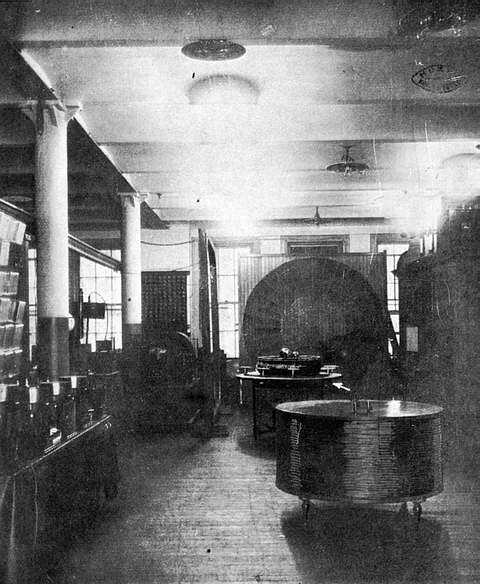 This type of coil can be seen in the photograph of the second laboratory (above). The primary and secondary coils were both mounted on a wooden base and could be pivoted to bring the coil into a horizontal position. The oscillator on his main spiral coil was powered by a 50,000-volt transform, which charged a 0.04-microfarad condenser . This was discharged though the eight foot (244 cm) primary, which was a single turn of heavy stranded wire; by means of a high speed mechanical break (replacing the spark gap used in earlier coils). This rotary break closed the circuit 5000 times per second. The inductance of the primary coil was 8 micro henries, and the total inductance of the primary circuit was 10 mh. The frequency used on this coil varied from 230 KHz to 250 KHz. The secondary coil was made up of one hundred turns of insulated #8 copper wire. The turns began at the primary coil and were carefully spaced to reduce destructive capacitance in the coil, which will reduce the voltage and cause power loss. The outer rim of the secondary would be grounded or possibly connected to the primary. The center of the coil was connected to a bar, which stuck out and curved down slightly. A six-inch ball was sometimes fastened to the end of the bar. The maximum voltage of this coil was two and one-half to three million volts, which created discharges up to 16 feet in length. (The conical coil had produced up to 6-foot arcs). A large variety of experiments were carried on with this device. One of Tesla’s favorite demonstrations, to show that high frequency current was not harmful, was to stand on a platform connected to the oscillator and instruct his assistants to raise the potential to nearly 3 million volts . At that voltage, he was covered with sparks and said that he felt as though he were burning up. One of the most important discoveries that Tesla made was the effect that very high voltage had on the air’s insulating properties . Normally, air becomes a fair conductor at about 75 millibars, but Tesla found that with high frequencies and very high voltage, air becomes conducting at much higher pressure. Using the three million volt spiral coil, Tesla tested the feasibility of using the air to conduct power. He connected a 50-foot to be containing air at a pressure of 120-150 millibars to the central terminal of the coil . The other end of the tube was connected to the center of a similar coil that would act as a step-down transformer. With this arrangement, electric power could be transmitted with good efficiency. At three million volts, even air at normal pressure could conduct some electricity. 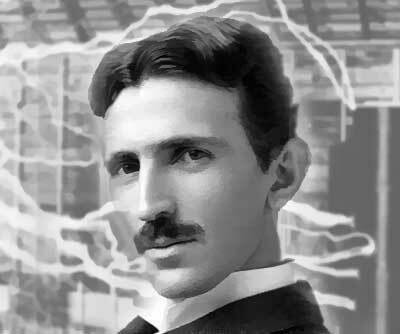 This led Tesla to believe that he had discovered a way to transmitting not just signals, but usable amounts of power. By using the atmosphere for one conductor and the ground for the other, power in quantities large enough for industrial purposes would be made available to anyone. This would, at first, have been used for illuminating isolated homes or other places where it was not practical to supply electricity. Tesla proposed building towers from which balloons would be flown. The current at a voltage of 20-50 million volts would be cabled up to 30 or 35 thousand feet where the air is adequately rarefied . Tesla had not tested voltages nearly this high, so he suggested that it may be possible to use a much lower altitude for the transmission. At 20 million volts, it would not require much amperage to yield a great amount of wattage, but it should not be immediately assumed that this system would really work. In the spring of 1897, Tesla began distance testing of his wireless telegraphy system(not to be confused with the aerial power system) . On a boat in the Hudson river, he placed a receiver and was able to pick up signals at a distance of 25 miles. This was not the greatest range of the system, but it was as far as the boat could go. He announced the completion of this invention in July of 1897 . Tesla made no attempt to patent this until several years later, after he had done extensive research on it. He did patent his aerial power system in 1897 (No. 645,576 and 649,621. Not granted until 1900) . The range of 25 miles was a considerable improvement over Marconi’s equipment, which had a range of two to nine miles at that time . 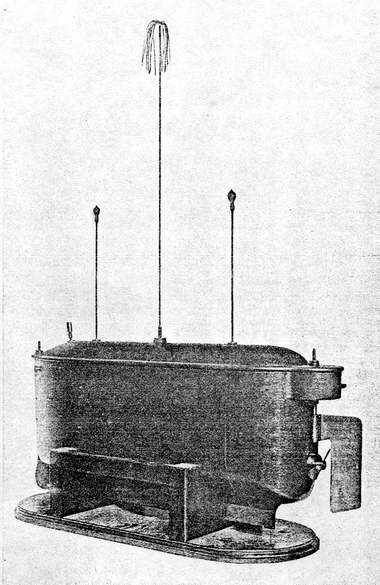 The oscillator was powerful enough to send signals to very great distances, but unfortunately, Tesla was not using long vertical antennas at that time. He was working on the principle that his signals were traveling through the earth as electric waves. In September of 1898, Tesla demonstrated a remote controlled boat in Madison Square Garden during the First Annual Electrical Exhibition . This boat is shown above. It was controlled by means of a single tuned circuit that caused it to change direction. It could be made to steer in different directions and stop and start with signals transmitted from a small oscillator near the edge of the huge tank the boat sailed in. Tesla called this machine an Automaton, and he believed that it would one day be used to fight wars. Tesla suggested that boats and flying machines could be filled with explosives and then directed to their targets for detonation. It was patented in November of 1898 (No. 613,809) . At that time, Tesla exhibited a larger boat containing several tuned circuits that could respond to signals sent at different frequencies. This boat employed wire loops within its hull that had condensers in them to cause them to resonate. There was no outside antenna. This vessel could stop, start, turn and light lamps mounted on it. Tesla was advised not to attempt to patent this type of system by his patent attorney. This may have happened because Sir Oliver Lodge had patented a method of tuning wireless telegraph circuits earlier that year . Copyright © 1972, 2013 Don P. Mitchell. All rights reserved. By 1899, the laboratory in New York was too small to carry out the further experiments needed to answer the questions about the earth’s electrical properties and resonant frequency . Tesla wanted to work with much more powerful oscillators, and his lab was already too small for the big spiral coil. When operated at 3 million volts, it sent arcs out striking the ceiling and walls. The solution to Tesla’s problem came when Leonard E. Curtis, of the Colorado Springs Electric Company, offered him the use of some land on Knob Hill near Colorado Springs . He also gave Tesla free electricity for his experiments. After receiving large donations from several wealthy friends, Tesla arrived in Colorado Springs on May 18, 1899 along with a number of trusted assistants and his chief engineer, Fritz Lowenstein . In New York, Tesla left George Sheriff in charge of the lab and the construction of some equipment that was later shipped to Colorado. Tesla hoped to build an oscillator many times more powerful than anything he had worked with before. He was certain that it would be adequate to determine if resonance effects could be produced in the earth, and even more important, to make high powered tests of wireless communications systems. Upon reaching Colorado Springs, Tesla began the construction of his laboratory. 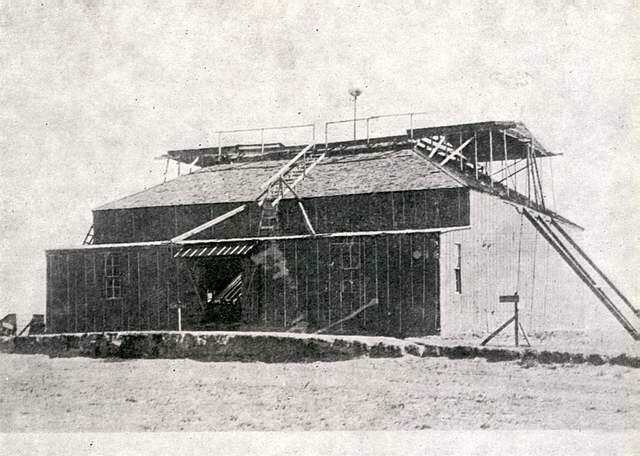 The building itself was a square, barn-like structure about 80 feet square . The walls were about 20 feet high, sloping up to 35 feet at the top. On top, sliding panels rolled back to make an opening in the roof (below). Tesla believed that this proved the earth acts as a body of finite dimensions and could be made to resonate. The disturbance of the lightning created ripples or waves that would spread out and affect any receiver with equal strength as they passed by if the earth acted as an infinite conductor. However, when the waves that Tesla measured spread out and then were reflected and superimposed, they formed nodes where they were much stronger than elsewhere. The simple fact that the waves could be reflected proved that a resonant condition could be produced if a powerful signal was in tune with the planet. The waves detected by Tesla in the lighting storm experiment were 25 to 75 kilometers long . The success of Tesla’s idea for transmitting current through the earth depended entirely on whether or not stationary waves had really been observed. The effects, which will shortly be described, did not necessarily require stationary waves and, in fact, can be explained in other ways. Tesla’s theories of ground transmission of electric waves are not generally accepted today, but this should not be allowed to belittle his accomplishments. Not a great deal is known about the apparatus that Tesla used in his Colorado laboratory, but pictures and articles written by Tesla have supplied some information. During the construction, Tesla kept in touch with the lab in New York, where much of the equipment was being made. In letters to and from George Sheriff, some of the equipment is discussed. New York was shipping balloons eight and ten feet in diameter and covered with varnish. 300 bottles with the necks ground off (probably for leyden jars), drums, oscillators and spools, 1100 feet of solid wire, and later 40,000 feet of cable. A number of storage batteries were also sent, along with nickel and aluminum chips and five grades of silver and gold filings for coherers. Inside the lab there was a small machine shop and an office. Tall coils and strange electrical devices crowded the building, but the giant oscillator in the middle of the main room dominated the scene. Tesla called this new type of coil a Magnifying Transmitter. He believed that it would create stationary waves of electricity that would encircle the globe and allow the transmission of intelligence and possibly even power through the ground without wires. Basically it was a giant Tesla coil, but with modifications in design to allow it to deliver incredibly high voltage. Along one wall of the lab, power cables, meters, switches, and the twelve storage batteries were located. Besides the secondary coil of the Magnifying Transmitter was the primary oscillator that energized it (above). This oscillator was far more powerful than the ones used today for most AM radio stations. At full capacity, it drew over 800 amperes from the power lines and delivered up to 200,000 watts to the transmitter. The low voltage line current was stepped up by 50,000-watt transformers (there may have been only one since Tesla rarely approached the 200 KW level), which were designed to give 60,000 volts. Tesla retapped them, however, to give 20 or 40 KV. 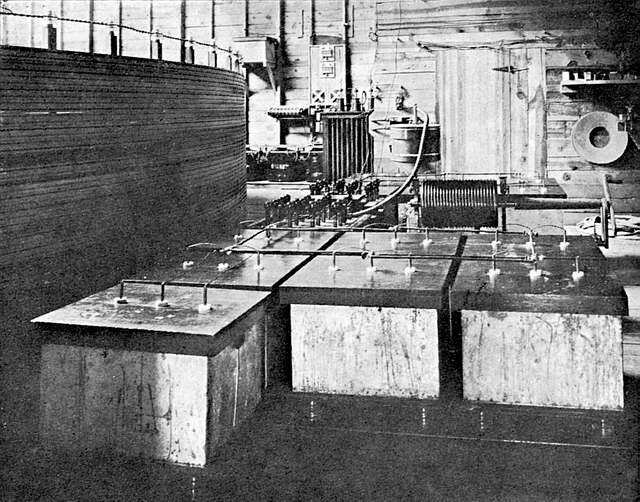 The transformers charged a bank of high-tension condensers made up of 13 tanks of oil with copper plates immersed in them and two more tanks with 16 leyden jars each (also immersed in oil for insulation and cooling). The condensers were discharged through the primary coil by means of a very heavy-duty 25-tooth rotary circuit breaker. 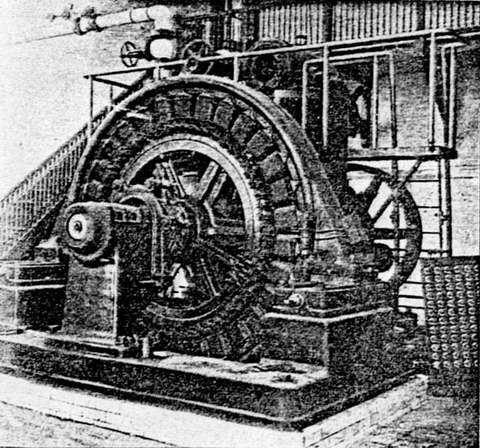 The primary circuit also contained a variable induction coil (seen above the condensers above) which consisted of 24 turns of heavy cable wound on a drum and could be adjusted by a crank from zero to 100 micro henries. The primary coil itself was a single turn of stout cable 17 meters (51 feet) in diameter embedded in the floor. Directly above the primary coil was a 51-foot circular wooden wall about seven or eight feet high upon which the secondary coil was wound. This had 25 or 30 turns of thick wire spaced with several inches between each turn. The top turn was suspended six or eight inches above the wall on glass telephone insulators. A second smaller coil was located in the center of the space enclosed by the wall. This coil was ten feet in diameter, ten feet high and stood three feet off the floor. 100 turns of wire were wound on this coil. A heavy wooden post was driven into the ground and extended up through the center of the coil to a height of about 20 feet. From there a metal pipe with a copper hood at the base to prevent corona loss rose up through the opening in the roof making a total height of nearly fifty feet. Nothing is known about the regulatory systems on this giant coil, but if it is anything like earlier models, then it was probably very highly controllable. 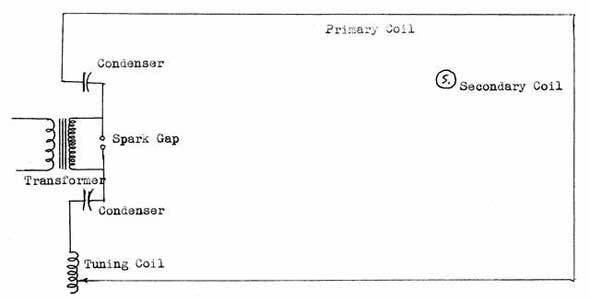 The variable induction coil and changes in the number of condenser tanks and leyden jars used would haveallowed a wide range of operating frequencies. Varying the speed of the rotary break and the voltage used in charging the condensers could have controlled power. There was almost certainly a variable choke coil between the condensers and the transformer to control power, prevent short-circuiting and high frequency feedback into the power lines. The most important experiments were carried on with the Magnifying Transmitter by itself without the ten-foot coil. In experiments carried on inside the lab, an 80 centimeter copper sphere mounted on a stand was used as the terminal. In the photo above [DPM - a double exposure], this set-up can be seen operating. Discharges of 20 or 30 feet could be produced easily by this coil, indicating 4 or 5 million volts. The most amazing thing about this coil was that, even though it was only eight feet from bottom to top, it could produce 30-foot arcs without shorting out. Tesla’s technique for accomplishing this is beautifully ingenious. The other trick that Tesla used was to create a path of very little resistance for the current, so that it would follow the wire to the 80 centimeter ball instead of jumping out at some other point in the circuit. In very high voltage experiments, an inverted metal pan was attached to the base of the ball and its dimensions were such that it would cause the arc to break out from it when the voltage was a maximum. The cable used in winding the coil was very thick copper and probably had a resistance of only a few ohms. This situation was highly unstable. Tesla was literally steering a lightning bolt, so great care had to be exercised. One of the most delicate problems was to keep the coil tuned properly. If the frequency impressed by the primary coil strayed too high, impedance would result in the secondary. This added resistance could cause the current to take a shorter path through the air. Tesla had a number of narrow misses with flaming discharges of inconceivable violence. Although high frequency current cannot electrocute a person in the normal sense of the word, the high currents would burn him to a crisp. The laboratory building was also set on fire several times in this way, but fortunately, Tesla had equipment to combat it. To prevent these accidents, the Magnifying Transmitter had to be started with care. The power was increased gradually and the frequency was carefully monitored. According to Tesla, the Magnifying Transmitter could operate in two modes. These were with damped or undamped oscillation. In the undamped mode, a continuous wave would be produced. To do this, Tesla probably used the same methods that he applied to his smaller oscillators before. Basically, this would involve increasing the rate of the rotary break so that the condenser discharges with great rapidity. The frequency at which the Magnifying Transmitter was usually operating was at 150 KHz for maximum voltage. Since most of the earlier rotary breaks operated at only a few thousand times per second, the wave train at this frequency would fade out between impulses. However, by this time Tesla had perfected his mercury interrupters (the type he generally used) to a much higher level. Some of them were able to handle up to 50 horsepower at a rate of 100,000 impulses per second . This would allow the primary circuit to feed impulses to the secondary so fast that each impulse would arrive before the preceding one had faded out. The system may have been identical to the timed spark system patented by Marconi in 1912 . Other modifications were undoubtedly made to allow for such a rapid charging of the condensers. The transformer may have been set at 20 KV and the ratio of capacitance to inductance would be made as low as possible, but still maintaining the 150 KHz frequency. These things would create a situation in which a small amount of capacitance would be charged with a relatively lower voltage but at a very high rate. This produced very constant oscillation but at a fairly low voltage. In fact, there was almost no noise or discharge produced. Although very low voltage (still many hundreds of thousands of volts) was created, the amperage was extremely high. At one time, Tesla measured 1,100 amperes, which would have meant 110,000 horsepower has been reached in the violently resonating circuit. Damped oscillation produces a wave train made up of very intense impulses, which fade out rapidly before the next impulse begins. It is logical to assume that Tesla adjusted the primary circuit to have a greater capacitance and less inductance (still tuned to 150 KHz). The voltage of the transformer would be stepped up to 40 KV (a condenser charged to twice a given voltage will hold four times the energy), and the circuit breaker would have to be slowed down. In this instance, the incoming energy would be used to charge a very large capacity less often than for the undamped oscillations, and thus produce extremely intense impulses. The usual precautions would be taken to handle very high voltage. Tesla was certain that the Magnifying Transmitter could produce voltages far above the 5 million volt level if enough power was used. To see how high the voltage would go, he connected the secondary coil to a copper sphere one meter in diameter that was located on the pole that extended up through the roof. As in most of his experiments, Tesla was forced to wait until after midnight before he could draw the heavy loads that he needed from the powerhouse. In earlier experiments in New York, Tesla had noticed that the high-frequency discharges made by his oscillators showed a marked tendency to shoot upwards into the air. This could have been caused by electrostatic effects or simply by rising of the ionized air that had been violently heated by the discharges. When the Magnifying Transmitter was running, it caused a very strong updraft through the opening in the roof. 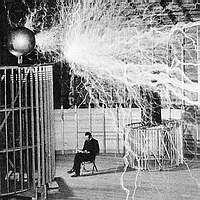 Tesla hoped that this effect would allow him to generate extremely high voltages without any danger of arcs striking the lab. When the power was increased to maximum, arcs of 50 to 70 feet were produced, which leaped off the ball and up into the air. Some of the impulses were even more powerful and discharges of over 100 feet were recorded! (The arc lengths were determined by comparisons to the height of the lab in photos take of the arcs) . These discharges were so loud that they were heard ten miles away. The record-breaking arc lengths were created by potentials as high as 18 million volts. This may be the highest voltage ever produced by a generator of electric current. The power consumption of the oscillator in producing 18,000,000 volts was highly prohibitive. In the first full power trial, the dynamo in the powerhouse started on fire. Tesla and his assistants graciously repaired the generator, but that was the end of free electricity for Tesla. 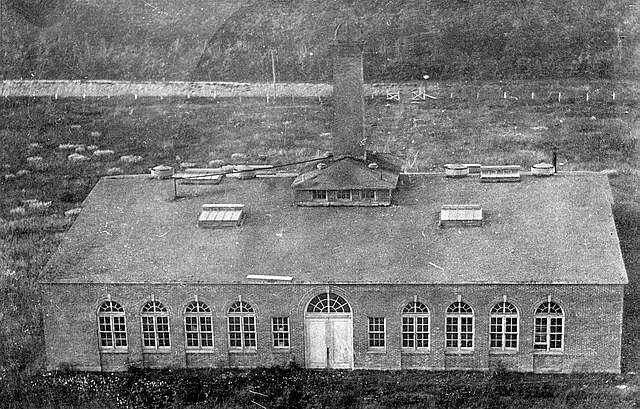 After the first experiments, Tesla added on to the laboratory building. Two derrick shaped towers rising up to 80 feet above the ground were built onto the roof of the building (above). A narrow tower was built up from the side of the lab just over the area where the primary oscillator was located. At the top was a beam with a ball hanging from it. The purpose of this is unknown. The other structure, which was much wider, was built over the opening in the roof and was used primarily to support a 200-foot mast with a one meter copper ball at the top. This mast was an extension of the 50-foot pole used in earlier experiments described. It was made up of sections of metal pipe that could be quickly dismantled in case of a sudden electrical storm. 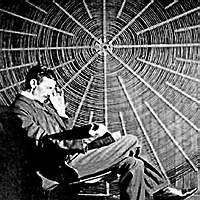 In one experiment described by Tesla, a square wire loop 50 feet on a side was laid out on the ground 100 feet from the oscillator. In the loop were three large incandescent bulbs in series and a tuning capacitor shunted across the bulbs. When the oscillator was operated at 5 percent power, the bulbs were lit to full brightness. In addition to this experiment, Tesla described a number of very unusual phenomena caused by the Magnifying Transmitter. When the secondary coil was fully energized, the ground around the laboratory was highly charged. At night, the ground shimmered with an eerie blue glow from sparks between the grains of sand. A person walking near the building would notice sparks forming between his feet and the ground. 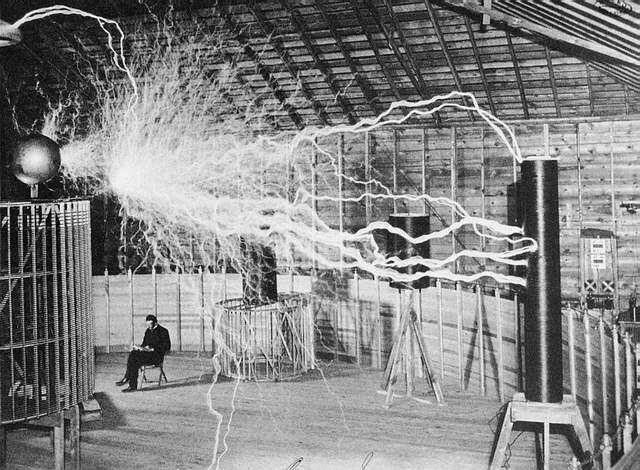 When the coil was operating at 4 million volts, Tesla could stand 60 feet from the lab and hold a light bulb. The filament would vibrate with such violence that it would quickly shatter. One amusing effect was that butterflies would sometimes be caught up and whirled around the building as if in a hurricane. Strange as it may seem, small Tesla Coils and Van DeGraff machines cause a similar display with small bits of foil. Tesla realized from experiments in Colorado that power transmission would probably not be practical through the earth alone, but he was still able to produce some startling demonstrations of this within a radius of 25 mils or so . When the secondary coil was producing 20 to 30 foot discharges as described earlier, the ground near the lab would be disturbed so strongly that arcs of an inch in length could be drawn from a water main 100 feet away. When operated in the undamped mode, horses a half a mile away would be spooked by minute shocks received thought their hooves. At full power, lightning rods 12 miles away would be bridged by small but continuous arcs. The most dramatic experiment with broadcast power was the lighting of 200 light bulbs at a distance of 26 miles . This involved the transmission of about 10,000 watts without wires. As impressive as all this sounds, the range of the transmission was not great enough for worthwhile power distribution. Tesla never completely abandoned the idea and, in some later articles, he said that it might be practical with bigger transmitters. Without knowing the details of Tesla’s discoveries in Colorado, it would really be impossible to say that he was wrong. The real reason that Tesla went to Colorado was to test his wireless signal transmitter. He said before he even left for Colorado that when he returned he would build a transmitter in New York that could reach Paris . Using special detectors, Tesla was able to receive impulses from the Magnifying Transmitter at a distance of 600 miles . This is far in advance of anything done by other experimenters working at that time. It may seem impossible that so much power could be radiated from the oscillator used by Tesla with its 200-foot mast to act as an antenna (Assuming that Tesla’s theory of earth conduction was wrong). In fact though, it is not unusual. The amount of power radiated by an aerial is equal to the square of the antenna current times the radiation resistance of the antenna . At 150 KHz, a 200-foot antenna would have a radiation resistance of only about two ohms. This is not very good for an antenna, but with the extremely high current developed by the Magnifying Transmitter, it would not be hard to believe that great quantities of power were transmitted. Besides these factors, there was also an advantage in using low frequencies and short antennas since these things encourage strong ground wave radiation . Tesla stated that he was also studying the electrical properties of the rarefied mountain air to see if his system of transmitting power though the atmosphere would be practicable. Nothing is known about these experiments, but they may have involved high-flying balloons, which Tesla said he used for some kind of experiment. When Tesla returned from Colorado, he said that aerial power transmission would definitely work on an industrial scale. When Tesla’s work in Colorado was completed, he returned to New York in mid January of 1900 . He immediately applied for a patent on the wireless telegraphy system that he had been perfecting in Colorado; however, the patent was not granted until 1905 . This patent described the stationary wave theory and stated that three conditions had to be met before the system would work. First, the frequency had to be such that the diameter of the earth would be an odd multiple of the quarter wavelength of that frequency. Tesla believed that the current for the transmitter traveled directly through the center of the earth, but more likely, it travels around the circumference. If this were so, then the distance from pole to pole along the surface of the earth would have to be used instead of the diameter, for calculating the frequency. The second condition was that the frequency should, for ideal results, not exceed 20 KHz, or radiation loss would impair the action of the transmitter. The third condition was that the wave train of the oscillator must last at least 1/12 of a second. That is the time that it took for the signal to go to the other side of the earth and return. Along with this, the patent also contains a receiving circuit that uses a synchronous rotary rectifier to detect signals. This circuit bears close resemblance to the “tickers” or tone wheels used a few years later with the Poulson Arc transmitters. In the tone wheel, a rapidly spinning wheel interrupts the radio signal from the antenna and heterodynes with it to produce a shrill whistle that could be heard easily with headphones. Tesla’s device would be for lower frequencies so he planned to have it more carefully synchronized to produce almost pure direct current. For the detection of signals that were too faint for headphones, Tesla proposed using a device he had invented in 1891 to respond to the direct current from the rectifier. This device consisted of an evacuated glass bulb with an electrode in the center. When this was connected to a high voltage transformer powered by an alternator (of high frequency), an electron “brush” was formed. This brush was so sensitive to electric and magnetic fields that a one-inch horseshoe magnet at six feet would cause it to be deflected. After succeeding in sending signals 600 miles in Colorado, Tesla felt that his long wave system was ready for full scale use. He set out immediately to design and build a giant Magnifying Transmitter on Long Island that would be able to send signals across the Atlantic to England. Beyond just replacing the underwater telegraph cables, Tesla conceived of a much more ambitious plan. Up to that time, most scientists were only interested in using radio for point-to-point transmission. Tesla, however, saw that wide range broadcasting was possible. Tesla was not sure if a single transmitter could be picked up all over the world (he had not tested his vacuum bulbs yet), so he suggested that a global network of relay stations might be required. He called this idea the “World System” and in 1902, he published an article explaining some of the points of the plan. This was printed during the construction of the transmitter. To help accomplish these things, Tesla was involved in the development of a number of new inventions. He was doing experiments with Selenium to see if pictures could be transmitted . This was the same approach that John Logie Baird used twenty years later when he invented television. Another invention was a technique to allow more careful individualization of signals. Tesla could already tune his transmitters, but with very sensitive receivers at great distances, he had difficulty with static. In this new system, two transmitters of different frequencies were used. They were arranged to emit their impulses simultaneously and would both send the same telegraph message. The receiver was also made up of two circuits, each tuned to one of the broadcast frequencies. The signal coming into each of the circuits would operate a relay, and the two relays would be connected in a logic “and” circuit, which would reject any impulse that did not come from both receivers at the same time. This ingenious system would have solved the difficulty of signal interference that was a problem to all experimenters of that time. Although Tesla could tune his equipment with much greater success than other more primitive systems, he was looking to the time when many stations would be operating within close limits of each other. Tesla did not want to build a separate Magnifying Transmitter for each frequency (at least not for telegraphy transmission), so he developed a way for one transmitter to send signals on many frequencies at the same time, thus creating a wave complex. Naturally it is not easy to make a circuit oscillate at different frequencies, but Tesla invented a means of allowing the transmitter to send impulses in a rapid succession of changing frequencies. This would have been done with a complex system of rotary breaks and tuning coils. This could still be used in the double circuit system just described because the impulses would be separated by an insignificant amount of time (thousand of pulses per second would probably have been used). It would be logical to assume that at least three or four frequencies could be sent in this manner by one station, and as many as ten might have been possible. As far as the secret transmissions that Tesla spoke of, we can only speculate. It would not have been difficult to send two meaningless sounding signals in which those impulses common to both signals contain the message. It is indeed unfortunate that more is not known about Tesla’s plans. He was a very great thinker, and he was hard at work to develop wireless to its highest potential. In the fall of 1900, Tesla received $150,000 from J.P. Morgan to build his transmitting station . Along with $50,000 from other wealthy friends, Tesla began work on the construction of an oscillator of incredible size and power. On March 21 of 1901, Tesla arranged for the Westinghouse Electric Company in Pittsburgh to make the transformers and generators that he needed to power the oscillator . During the entire project, Tesla worked closely with the engineers at Westinghouse Co. in designing apparatus. He had chosen a site on Long Island near the city of Shoreham for the transmitter. 200 acres of land were bought from James Warden, the manager and director of the Suffolk County Land Company (This area near Shoreham was then called Wardenclyffe). Twenty acres of the wooded property were cleared for building, and Tesla hoped to purchase an additional 2000 acres in the future of the “Radio City” which he hoped to start there . Tesla employed about fifty people in this new project, including guards to keep people away from the area. Tesla feared that someone might steal some of his inventions (many of which he never patented), and he wished to keep things quiet until he was finished. The famed architect, Stanford White, who was a personal friend of Tesla’s, designed a laboratory building (seen above) that would house the power plant and oscillator . Five or six other buildings were to be built later on. Tesla may have planned to build a number of transmitters at that site as his company expanded. The laboratory was a brick building about 100 feet square and as tall as a two-story building. It was completed in a few months, and the concrete footings for a huge tower were laid 250 feet south of the building. Tesla had ordered a couple of 100 horsepower steam engines and they were installed in the power plant in November of 1901. A 300-kilowatt Westinghouse Alternator (above) was installed later. The laboratory building was divided into four parts: the boiler room, the engine and dynamo room, a workshop containing eight metal lathes, and a laboratory. The building also houses offices and a small library. 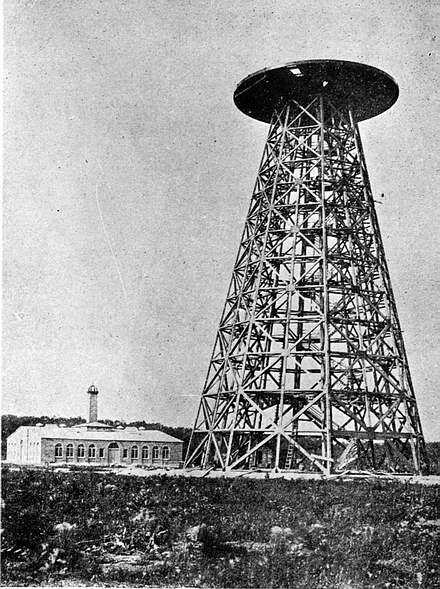 The oscillator, for what would have been the largest Tesla Coil ever built, was contained in the building and would be connected to the primary of the Magnifying Transmitter by underground cable . Four seven-foot high steel tanks filled with oil were to contain the high voltage transformer. Seven more tanks would house the condenser bank, and one special tank was to be filled with a system of coils and regulating apparatus for controlling the frequency and power of the oscillations. Not all of this equipment was installed, but even when not finished, the inside of the lab was an impressive sight. Its huge tanks and giant pieces of machinery made contemporary efforts at wireless transmission seem very pitiful. In December of 1901, Marconi made history by transmitting the letter “S” across the Atlantic . The equipment that he used was a crude single circuit transmitter (as opposed to Tesla’s primary-secondary type) contained in a small building and operated by a heavy wooden lever. Although Marconi’s achievement was great, Tesla was far ahead of him. Some of Tesla’s agents were already searching for a suitable area in Britain for a major receiver and relay station. In June of 1902, Tesla moved out of his laboratory on Houston Street and into theWardenclyffe building . The laboratory section was soon filled with lecture equipment, coils, X-ray machinery and other devices. In the workshop, glass blowers were busy making the electron bulbs that Tesla hoped to use in his receivers. The most striking object at this site was the strange tower that was being constructed there (above). This was to be the actual Tesla Coil or Magnifying Transmitter.The tower was made out of large wooden beams joined together with copper gussets and bronze bolts. No ferrous metals were used anywhere in the structure because of magnetic hysteresis which would cause heating and power loss. The sections were constructed on the ground and later hoisted into place with cranes. When completed, it was a pyramid shaped tower having eight sides. The smallest dimension across he base was 95 feet, and it stood 154 feet high . By the early part of 1903, a 55 ton copper mesh dome was placed on the top of the tower. This dome was 66 feet in diameter and was to have been covered with copper sheeting to form a giant copper electrode elevated above the ground by the insulating wooden tower. With dome, the tower stood 187 feet tall (above). Beneath the tower a copper pipe was driven 150 feet into the ground to make a good earth connection. Local rumors told that pits and underground tunnels were being constructed, but these do not appear to be true. Years later, there was reported to be well 12 feet wide and 100 feet deep at the site of the tower. The exact plan of the Magnifying Transmitter is not known because it was never finished. However, from what is contained in interviews with Tesla for newspapers, it is known that it would have resembled diagrams in one of Tesla’s patents (No. 1,119,732). This patent (above) deals mainly with methods of handling very high voltage. In the diagram, “C” is the primary coil of a Magnifying Transmitter. “G” is the oscillator, “A” and “B” are two sections of the secondary coil, and “D” is the elevated terminal, a torus shaped electrode, in this case. The bumps on the terminal (“P”) are to prevent the freely resonating circuit from getting out of hand. If the voltage gets too high, it would arc from one of these bumps instead of some part of the circuit nearer the ground. With energy that would have dwarfed the Colorado transmitter, this station could destroy itself by such an accident. The reasons for not completing the Wardenclyffe station were numerous. In the fall of 1903, J.P. Morgan withdrew his support of the project and a number of other financiers quickly followed him . Tesla was sued several times from Colorado Springs for unpaid bills and even had to appear in court out there on September 6 of 1905 . To get money, Tesla ordered the Colorado Springs lab sold, and in 1906 some of his equipment was put up for auction there. To top all this off, Tesla’s AC motor patents in Europe expired and left him without any income from royalties. In 1905, Tesla had set up a temporary factory in the Wardenclyffe building and began to manufacture Tesla Coils for medical and industrial use . He also invented a new type of turbine that operated without blades . This machine worked very well, but no one seemed interested in it. 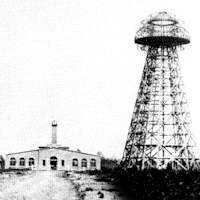 In spite of all the financial troubles Tesla had, it may have been his health that forced him to abandon the Wardenclyffe building in 1906. He had suffered from several serious nervous breakdowns brought about from over work (Tesla slept about five hours a night and the rest of the day was filled with work) during the past two decades before then. Local people reported seeing Tesla collapse from exhaustion while taking a walk by the sea. In 1912, Westinghouse removed their equipment, which had not been paid for, and in 1915 Tesla was forced to turn over the mortgages to the property to Waldorf Astoria . In July of 1917, they had the tower torn down and sold for scrap. The building was sold in 1938 to Peerless Photos Products Inc. who transformed it into a factory for making light sensitive paper . After leaving Wardenclyffe, Tesla opened up an office at 165 Broadway in New York . By this time, Tesla did not have enough money to carry on much research, and he became more and more of a recluse. In 1915, he became involved in a law suite with Marconi . Tesla claimed that Marconi’s patents were in violation of his own patents No. 645,576 and 649,621. Tesla lost this sit, but in 1943, Marconi’s key patents were invalidated by the Supreme Court . In the years after Wardenclyffe, Tesla wrote a number of articles in which some of the details of his earlier experiments were revealed. Many facts about Tesla’s work may never be known, however. His laboratory in Colorado Springs was destroyed so completely that today no one seems to know the exact place where it was located (the city of Colorado Springs expanded out over the area). On May 23, 1966, an historical marker was placed near the site . The detailed plans for Tesla’s fabulous Wardenclyffe broadcasting plant appear to be lost (Peerless Photos has made an extensive search for the plans, but the building firms, libraries and historical societies in that area have no idea what became of them). Tesla’s greatest misfortune seems to be that he was (at least) twenty years ahead of his time. Few people understood Tesla’s ideas, and Tesla did not go to great lengths to make them clear. 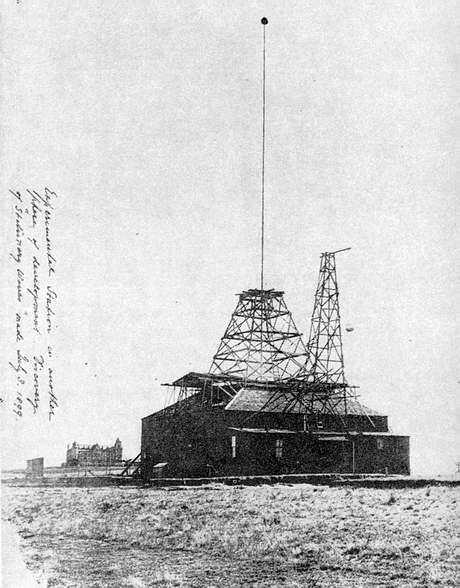 It is indeed ironic that only two miles from Tesla’s lost Wardenclyffe plant, the Radio Corporation of America years later established at Rocky Point, one of the most powerful broadcasting stations in the world . Special thanks to Mr. Vernon Goodin and the Moorhead Public Library (Moorhead MN) for assistance in obtaining articles. Thanks also to Carleton College Library, Cleveland Public Library, Macalister College Library, North Dakota State University Library (Fargo ND), Penrose Public Library (Colorado Springs, CO), University of Iowa Library (Ames, Iowa), University of Minnesota Library (Minneapolis), University of North Dakota Library (Grand Forks), and the University of Wisconsin Library (Madison). My thanks to the following organizations for their cooperation and help: The Carnegie Institution of Washington, The New York Historical Society, The Smithsonian Institution (Washing ton DC), The Society for the Preservation of Long Island Antiquities (Setauket, LI), and Peerless Photo Products Inc. (Shoreham, LI). Special thanks to Mr. Leland I. Anderson of Denver CO for his assistance. Thanks to Mr. Jeff Hohman of Pelican Rapids MN, Mr. George Martin of Cormorant MN, and Mrs. Rosemary Hetzler of Colorado Springs CO for their help in obtaining articles on Tesla. For their helpful information on Tesla, my thanks to Mr. Thomas R. Bayles of Middle Island, LI, Mr. Harry Goldman of Glen Falls NY, and Mr. E. J. Quinby of Summit NJ. My thanks also to Mrs. Maryann Franklin and Mr. Richard Macgregor of Pelican Rapids MN for assistance in putting this report in proper form. 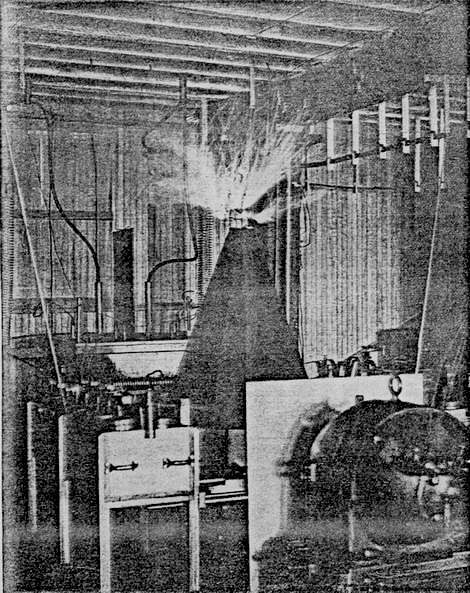 “Tesla’s Laboratory Burned”, Electrical Review (of New York) , March 20, 1895, p 145. O’Neill, Op. Cit., p 86. “Electromagnetic Waves”, Encyclopedia Britannica 1970, VIII, p 233. Thomas Commerford Martin, The Inventions Researches and Writings of Nikola Tesla, Second Edition , New York, Press of Milroy & Emmet, 1894, p 381. O’Neill, Op. Cit., p 91. Nikola Tesla, “My Inventions: 5. The Magnifying Transmitter”, Electrical Experimenter , June 1919, p 173. Thomas Commerford Martin, “Tesla’s Oscillator and Other Inventions”, Century , April 1895, pp 926-927. O’Niell, Op. Cit., pp 130, 131. Patent No. 645,576, “System of Transmission of Electrical Energy”, March 20, 1900, p 3. Samuel Cohen, “Mr. Nikola Tesla and His Achievements”, Electrical Experimenter , February 1917, p 713. O’Niell, Op. Cit., p 105. O’Niell, Op. Cit., p 123. “Radio”, Encyclopedia Britannica , 1970, XVIII, 1038. “The New York Wizard of the West”, Pearson’s Magazine (London) , May, 1899, pp 470-476, and O’Niell, Op. Cit., pp 155-165. Nikola Tesla, “My Inventions: 5. The Magnifying Transmitter”, Electrical Experimenter , June 1919, pp 173, 176. Patent No. 645,576, “System of Transmission of Electrical Energy”, March 20, 1900, pp 3-4. Kenneth M. Swezey, “Experiments with Tesla Resonator”, The Experimenter , July 1925, p 625. O’Niell, Op. Cit., p 142. Patent No. 645,576, “System of Transmission of Electrical Energy”, March 20, 1900, p 4. O’Niell, Op. Cit., p 126. Patent No. 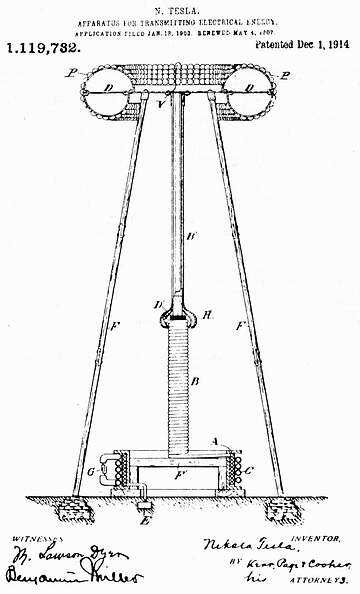 645,576, “System of Transmission of Electrical Energy”, March 20, 1900, p 1 and Patent No. 649,621, “Apparatus for Transmission of Electrical Energy”, May 15, p 1. O’Niell, Op. Cit., p 175. “Tesla’s Wireless Boat”, Scientific American , November 19, 1898, p 326. “Radio”, Encyclopedia Britannica , 1970, XVIII, 1039. New York Tribune , May 19, 1899, III, p5:1, and O’Neill, Op. Cit., p 176. Note: The exact dimensions of the lab are not known. A number of approximations have been made, however, from photographs. Nikola Tesla, “Transmitting Electrical Energy Without Wires, Scientific American , June 4, 1904, supplement. Patent No. 787,412, “Transmitting Electrical Energy Through the Natural Mediums”, April 19, 1905. 44. Nikola Tesla, “Transmitting Electrical Energy Without Wires, Scientific American , June 4, 1904, supplement. Samuel Cohen, “Dr. Nikola Tesla and his Achievements”, Electrical Experimenter , February 1917, p 713. “New Inventions By Tesla — Address at meeting of New York Section of National Electric Light Association, May 15, 1911, Electrical Review (New York) , May 20, 1911, p 987. O’Neill, Op. Cit., pp 193, 194. Nikola Tesla, “The Problem of Increasing Human Energy”, Century , June 1900, p 209. R. S. Glasgow, Principles of Radio Engineering , New York, McGraw-Hill, 1936, p 434. Patent NO. 787,412, “Transmitting Electrical Energy Through the Natural Mediums”, April 18, 1905, p 1. “The New York Wizard of the West”, Pearson’s Magazine (London) , May 1899, p 475. O’ Neill, Op. Cit., pp 210-211. “Mr. Tesla at Wardenclyffe, Long Island”, Electrical Worlds , September 28, 1901, pp 509-510. and “A New Tesla Laboratory on Long Island”, Electrical Worlds , September 27 1902, pp 499-500. O’ Neill, Op. Cit., p 204. Brooklyn Eagle , April 24, 1939, p 1. I.O. Evans, Inventors of the World London, Frederick Warne & Co. Ltd., 1962, pp 140-141. Leland I. Anderson, , p 148.Op. Cit. O’ Neill, , p 198.Op. Cit. Leland I. Anderson, “Wardenclyffe–A Forfeited Dream (part 2)”, Long Island Forum , September 1968, p 169. Ibid, p 170 and O’ Neill, , pp 218-228.Op. Cit. Anderson, Op. Cit., p 171. O’ Neill, Op. Cit., p 214. “Tesla Sues Marconi on Wireless Patent”, Electrical Review , August 14, 1915, p 297. Free Press, Colorado Springs, Colo. , May 24, 1966, p 20. The Sunday Review (New York), March 18, 1962, p 10.